Understanding temperament has the potential to better inform treatment and intervention choices as well as promote awareness for qualities that are somewhat malleable. Essentials of Temperament Assessment presents balanced coverage of those instruments that directly measure temperament qualities in adults and children. This guide enables mental health professionals to select the method that best fits the situations, groups of people, and programs that are involved. 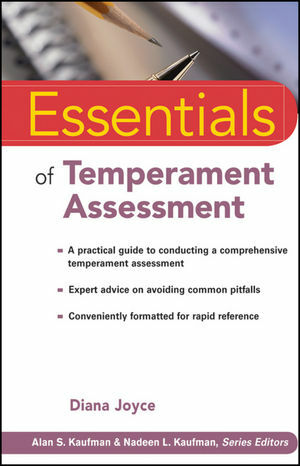 Offering a myriad of ways to assess temperament, Essentials of Temperament Assessment arms professionals with the most appropriate technique or combination of techniques for their particular temperament assessment purposes. Diana Joyce, PhD, is an Associate Scholar in the School Psychology Program at the University of Florida with licensure as a psychologist and school psychologist. She has taught numerous assessment courses and supervises graduate student practicum work across four county school districts and several clinic sites. Her research and publications have included studies of temperament qualities of gifted children as well as temperament characteristics of students with conduct disorders. One Overview of Temperament Theory. Two Empirical Foundations for Temperament Theory. Three Validity and Reliability in Temperament Assessment. Five Strengths and Limitations of Temperament Assessment. Six Clinical Applications of Temperament Assessment. Appendix: Definitions of Temperament Terms.